This tool is used for importing Emails, Personal Contacts and meetings, into Hyper users data. Email Files into Inbox - Import Email files into the user's Inbox. Email Files into Outbox - Import Email files into the user's outbox. Personal contacts from .csv Files - Import personal contacts from .csv files (Excel file), into the user's personal contacts list. Personal contacts from .vcf Files - Import personal contacts from .vcf files (Virtual Contact file), into the user's personal contact list. Meeting from .ics Files - Import meeting from .ics file (Meetings file) into the user's Calendar. 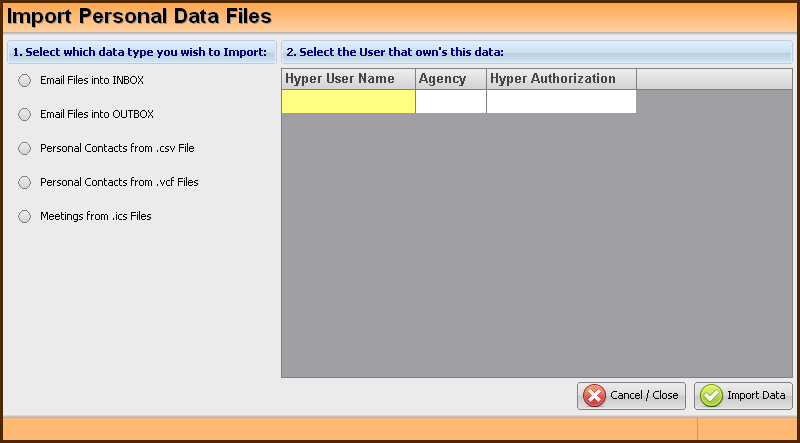 After choosing the required data type, the list of the Hyper users will be displayed. Select the required user to import the data to, and press the Import Data button. In the opened window, select the required source data folder and press OK.